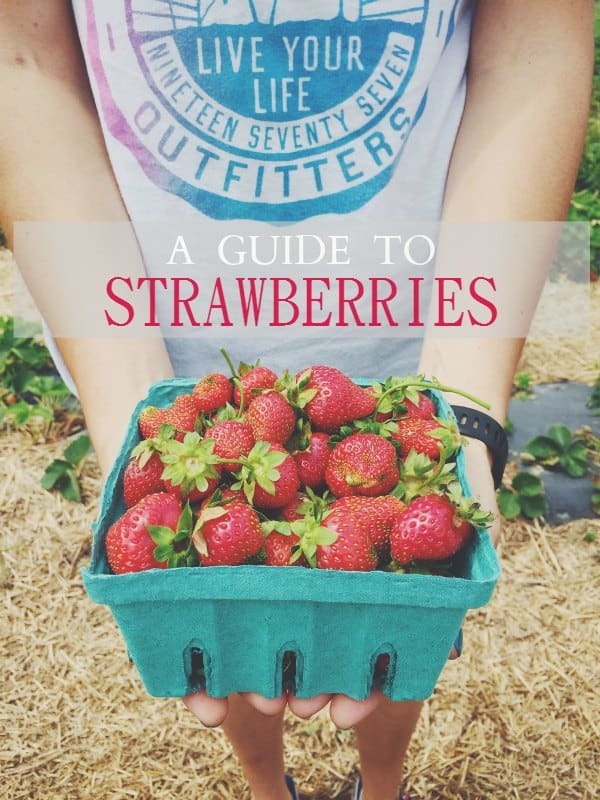 This guide to strawberries will tell you everything you need to know about the late spring berry including how to pick, store, cook and bake with them. It’s crazy how much of a difference a couple of weeks makes when it comes to seasonal produce. After last month’s somewhat disappointing trip to the farmers market and a lonely bag of pea shoots that got turned into this sweet pea lemon crepe cake, this month’s visit was quite different. 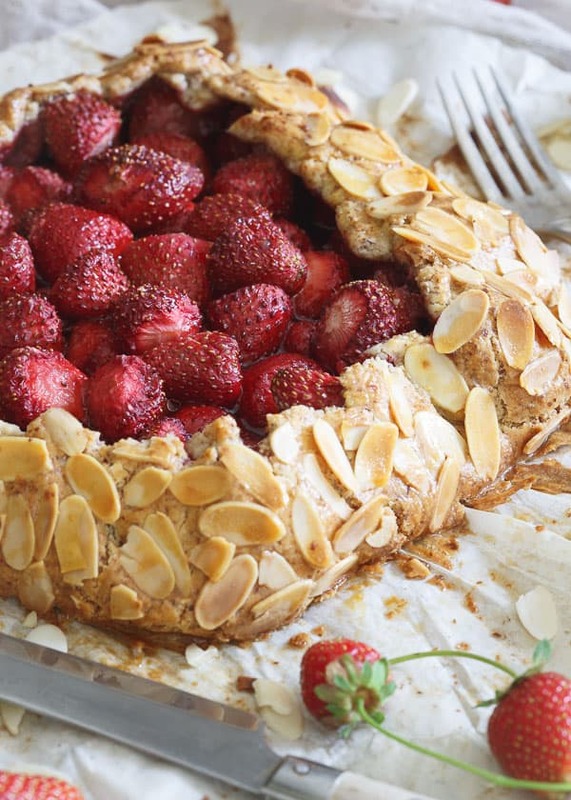 I’ve already gone into detail about the strawberry picking experience in this strawberry almond galette and since then I’ve gotten even more emails from the farm about cherries and raspberries being ready to pick! Before moving on to the summer stuff though I think we should celebrate the strawberry one last time and ride out strawberry season until the very end. 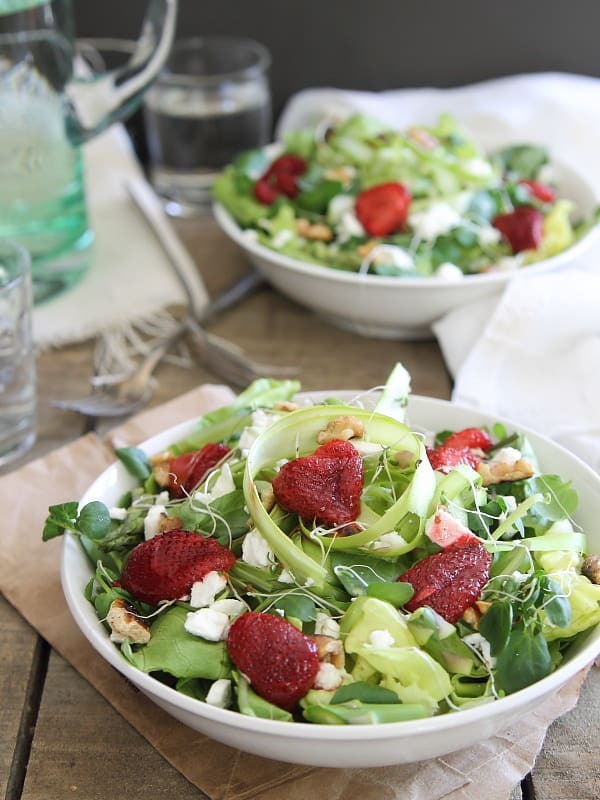 Strawberries are special because they’re the first fruit that really signifies “spring“. They’re a welcome sight of red juicy deliciousness after a long winter of apples, pears and citrus, all of which are delicious but very much NOT a berry. Don’t miss this Guide to Apples or this Guide to Peaches for more great fruit info! Strawberry season: May-August (<–see! it’s not over yet) Although this will very much depend on your location, in New York, locally grown strawberries are primarily available late May through July. What to look for when picking strawberries: Strawberries don’t ripen after they’re picked so look for bright red, firm berries without any mushy spots. The tops should be bright green. If you’re buying from a store, avoid any packages with mold, it spreads very quickly! If you’re picking from field or buying locally, expect the berries to be smaller than you’re used to, don’t be deterred, the smaller berries are just as (if not more!) sweet. How to store strawberries: Keep berries whole until using. Cutting off the tops or washing them before storing will result in a shorter life span of the berry. Refrigerate the berries when you get them home and keep in the produce drawer if possible. If you’re in danger of losing strawberries to mold before being able to eat them all, don’t fret, freeze them! Wash and hull the berries, then store them in a plastic bag in the freezer. They make a great addition to smoothies –> how to make a healthy smoothie. Nutritional benefits of strawberries: Strawberries are a vitamin C powerhouse. Just one cup has 113% of your daily vitamin C. Oranges usually get all the praise in this department but strawberries are the forgotten underdog! They’re also ranked 3rd as the best source of antioxidants among all US foods. 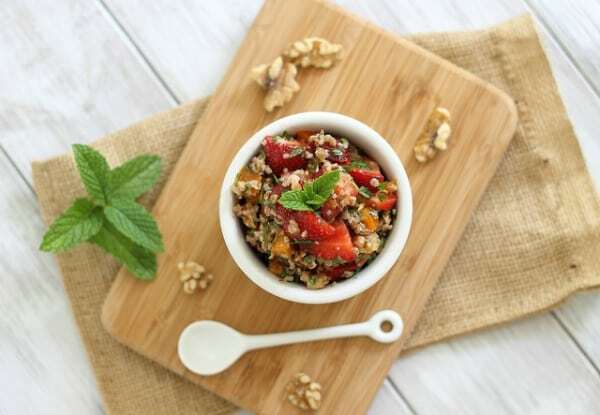 Fun fact: Strawberries have over 200 seeds on the outside of each berry! LOVE strawberry season. Next to apples, they’re my favorite ;) I never knew they packed so much vitamin c! LOVE strawberry season! I’ve been picking up almost a pound of them every week, as the organic ones are priced so well here in Chicago! Thanks so much for including my French toast :) Can’t wait to see you again on Friday! Strawberries are my favorite! I have a giant bag full my SIL gave me on Saturday so I’m up my ears in fresh berries. 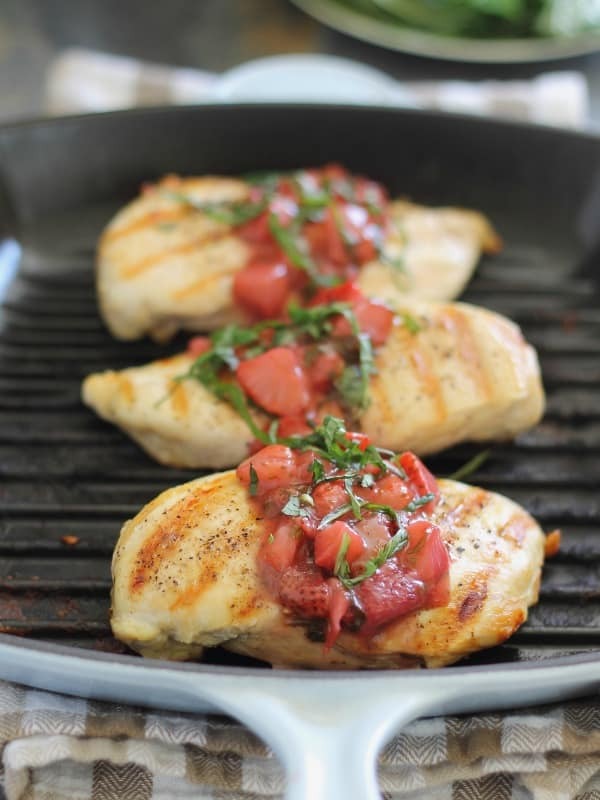 Love all of these recipe ideas…yum! Strawberries are amazing this year! So flavorful and sweet. With my daughter and I they don’t last very long in our house! Long live the berries!! There’s still so many I want to eat and treats to bake, so I’m not ready to let them go yet! My kids eat strawberries morning, noon and night, we go through so many pounds a week! 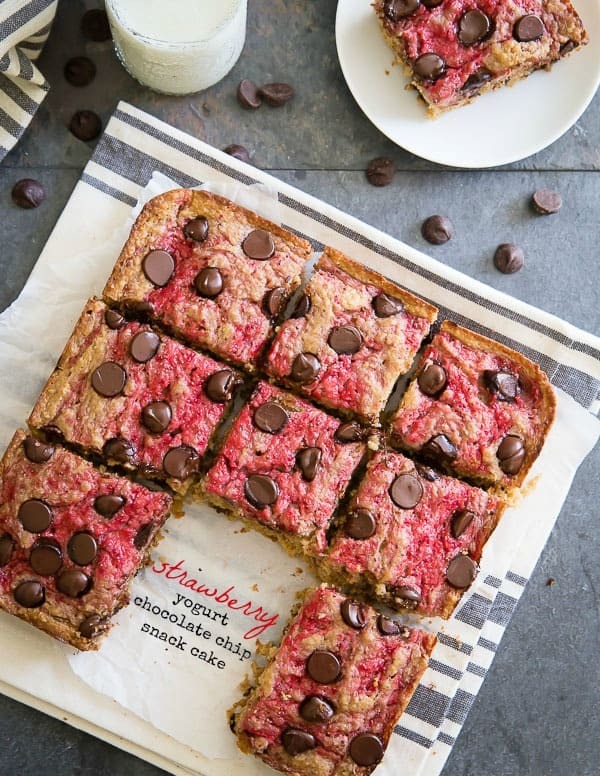 That strawberry yogurt chocolate chip snack cake is calling my name! Yum, I’m SO happy that strawberry season is upon us right now. I snack on them all day long! Love all the recipes you linked here, too! That tart is amazing! The strawberry care looks really great! What a great post! Strawberries are probably the most consumed fruit in my house, can’t get enough! What’s funny is in Florida our strawberry season starts in December!!! Crazy right? Then we have a couple month lull until the rest of the berries start coming in from everywhere else (phew). What an awesome post! Strawberry season is no joke in our house. I’ve spent so much on them already lol! And I still need to make jam, oops. Best season ever! Though I was a bit let down when I recently bought a pack of strawberries – turned out the ones in the middle were rotten already. Just buy in bulk and try to check if they are all of good quality beforehand. I can’t wait to use what I learned and go pick some strawberries! It appears that I have been doing it wrong my entire life!